Editor’s note: Known as one of aviation’s keen-visioned pioneers, Alfred W. Lawson is one of those few men who, back in the earliest days of flying, dared to look into the future and predict that the day was coming when giant ships of the air would carry passengers comfortably, safely, and swiftly to destinations throughout the world. Not content with mere prediction, he has been quietly working out the design of a gigantic passenger airplane which will be the largest in America when completed. In this interview, one of the very few he has ever accorded, he reveals interesting facts concerning his past and present work in aviation, and explains in detail features of his huge 125-passenger air liner. BACK in aviation’s uncertain pioneering days in 1908, when I was editor of Fly, then the national aeronautical magazine, I was regarded as a prophet of doom. The general public, which is always skeptical at the appearance of engineering innovations, sneered and scoffed at my forecasts for flying. Everywhere I was regarded as a crank. It is a wonder I wasn’t condemned to the stake for witch-craft, now that I reflect on turbulent days that have gone. During the twenty-two years that I have now completed in the field of aviation, sticking tenaciously and doggedly to my theories and principles through periods of time when the future of aviation seemed doubt- ful, I have seen that industry rise from a struggling business to the most thriving enterprise on the great American commercial scene. Today, no less enthusiastic in my belief in aviation than I was twenty-two years ago, I am the advocate of the air-liner. My disciples are legion, at this time, however. The Graf Zeppelin’s round-the-world flight, the incarnation, so to speak, of one of my ideas, has demonstrated that my ideas are not so fantastic as they once were thought to be. Rarely have I come from behind the scenes to be interviewed for publication. My mission and my work in aviation has at all times been that of the quiet producer. On this occasion I have been induced to enter the limelight for a brief moment in the interests of the industry which has occupied my attention night and day for twenty-two years. I am pleased to tell about my super air liner and the future which is in store for this branch of aeronautics. At the present time I am building in my factories’ at Trenton, New Jersey, an enormous double-tier super air liner which will carry 125 passengers. It is only partly finished and will require another year for completion. It will cost in the vicinity of $500,000. It was back in 1909 that the first air liner was born in my brain. I saw the idea in the crude Bleriot fuselage. 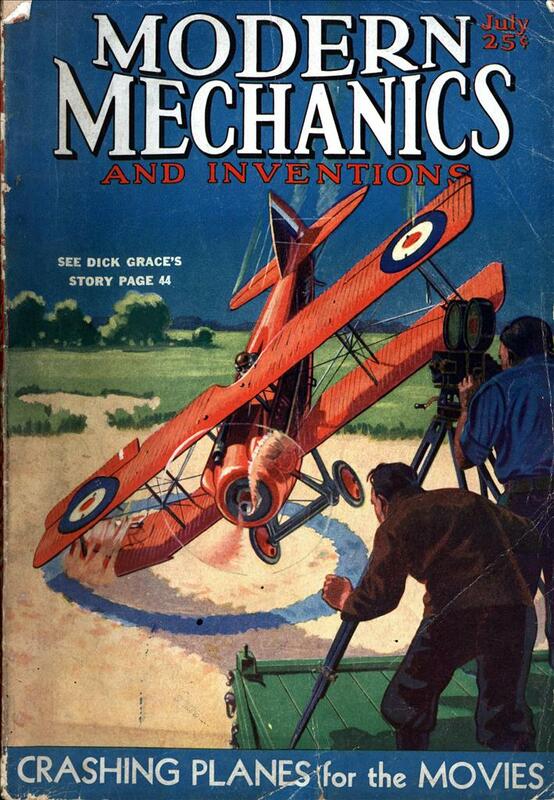 However, it was not until 1919 that the industry had developed sufficiently to allow me to build an air liner. During those intermediate ten years my mind was thinking about big, practical air carriages. At the same time I was quietly accumulating the knowledge and experience necessary to build them. In 1919 I first demonstrated the practical usage of the air liner in a successful flight from Milwaukee through New York City to Washington and return, personally acting as captain and navigator, and with nothing but a map, a compass and my sense of direction for guidance. On August 27,1919, without any advance notice, I covered the first lap of the trip from a point ten miles north of Milwaukee to Chicago, a distance of more than 100 miles, in less than an hour. Betting ran high in Milwaukee that day and few imagined that the weighty machine would ever soar from the earth. They called me a drunkard of dreams. But today I sit back in my offices at 1819 Broadway, New York City, and during odd moments there flash across my mind the spectacles of my types of commercial airplanes flitting across the American and European continents—all dreams which have come true. 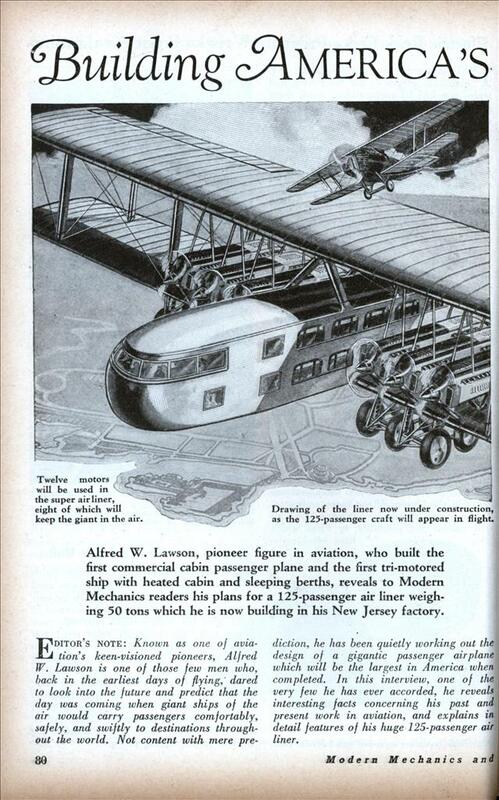 When the Lawson 125 seater air liner proves to be the success which I expect, I shall enlarge my factories and build planes of this type in mass production. We will be able to turn them out as fast as flivvers once we get started. In the latest Lawson air liner now under] construction, the front section of the cabin, rounded out to reduce wind resistance, will be devoted to the pilots and mechanics. Two pilots will sit up front at the dual controls. Beneath them space has been provided for the mechanics. They will remain there until some emergency makes it necessary for them to crawl out on the wings to the motors. On either side of the cabin and half-way back trap doors have been built in the sides through which the mechanics will pass to reach the engines. It will not be necessary for the ship to descend to make repairs. Directly behind the extreme front compartment and next to the cabin are the officers’ quarters, where the conductor can count his tickets and discuss with the pilots whether or not they will arrive on time. The next section is the main passenger cabin itself. There is an aisle through the center and double seats on both sides. Above is another tier of seats which are reached by steps located at intervals. Inside, the cabin resembles the ordinary Pullman car made up for the night, except that seats take the place of berths. The passengers will make the trips in chairs, although the liner can be converted into a sleeper in two hours. A porter in the customary white coat will serve light lunches and put up tables between seats for card games, or for passengers who elect to spend the time writing letters. The compartment behind the cabin will be used for freight and mail and the sorting of mail during the trip. Two lavatories will be installed in this part of the ship. The ship will be equipped with twelve motors. Only eight of them will be necessary to keep the plane, weighing fifty tons, in the air. Each of these motors will develop 400 horsepower. The four reserve motors will insure the safety of the ship. Six men as a crew will be all that will be needed to man the new Lawson super air liner, so the operating expenses will be low. By the way, the fuselage is 100 feet long and the wing spread is 200 feet wide. As I designed this giant airplane, I had in mind not only safety and economy but also speed. I have calculated that my ship will make 100 miles an hour easily and steadily. When I speak of air transportation, and it is my remotest notion ever to over-leap the bounds of modesty, I unhesitatingly say that I know whereof I speak. In 1913 I was christened the first air commuter when I flew daily from my New Jersey home to my New York office. In 1918 I built the first commercial cabin passenger plane, in which people could actually stand up and walk around. In 1920 I built the first three-engine air liner with sleeping berths, heated cabin and mail chutes. And if I may be permitted another admission, those who have followed the glowing pages of aviation’s history will recall that on August 10, 1918, I appeared before War Department officials and proposed a trans-oceanic float system, installing landing stations in relays along the route from America to Europe. Today such a float system is actually in the course of construction. When I look into the vastness of space and see the marvelous workings of its contents… I sometimes think I was born ten or twenty thousand years ahead of time. In the 1920s, he promoted health practices including vegetarianism and claimed to have found the secret of living to 200. He also developed his own highly unusual theories of physics, according to which such concepts as “penetrability”, “suction and pressure” and “zig-zag-and-swirl” were discoveries on par with Einstein’s Theory of Relativity. He published numerous books on these concepts, all set in a distinctive typography. Lawson repeatedly predicted the worldwide adoption of Lawsonian principles by the year 2000. He also developed, during the Great Depression, the populist economic theory of “Direct Credits”, according to which banks are the cause of all economic woe, the oppressors of both capital and labour. Lawson believed that the government should replace banks as the provider of loans to business and workers. Love the comfy armchair in the cockpit! I like that mechanic standing in the prop wash tinkering with the engine. Wonder what OSHA would have thought about that? Hope he doesn’t get too distracted by those small planes buzzing around the wings. Lawson was an advanced thinker. People often make fun of things that they don’t understand. Anyone who calls him a kook does so because they are not very informed. Much of what he advocated in his later years as a writer reads as if it could have been written today. IE: His benefactor “Stealing America” demonstrates that nothing much has changed as far as the financiers running our government and the dire straights of our economic problems of today. I’ve read about the Mysterious Midnight flight that they claim was a disaster, unfortunately, what is omitted from any information on that flight is that he realized it was necessary to have lighting on a runway and was the first to implement that. Perhaps because he was also responsible for lighting in baseball parks earlier in his career. Thus night baseball.